Joan Stewart, 42, pleaded guilty to a number of charges of selling and possessing with a view to selling counterfeit branded goods in breach of the Trade Marks Act 1994. The offences were committed via specially created Facebook pages called Named Brands and Brand Names Elgin. The case was investigated by the council’s trading standard staff who monitored the Facebook pages and carried out a series of test purchases in conjunction with officers from Highland Council. 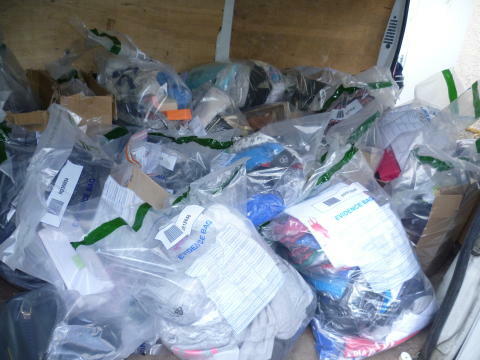 Joan Stewart’s address in the Elgin area was subsequently raided by Moray trading standards officers and Police Scotland in May 2014 when 46 bin-sized evidence bags of goods were seized. The haul included Barbour and Armani jackets, Chanel scarves and jewellery, Converse and Nike trainers, Ralph Lauren T-shirts and polo shirts, Jimmy Choo and Michael Kors bags and handbags, Rayban sunglasses and Ugg boots, all of which were later verified as being counterfeit by the trademark holders’ representatives. Commenting on today’s outcome, Moray Council trading standards manager Peter Adamson said: “We are very pleased with this result which reflects on the seriousness of this particular case and on the hard work and diligence of our officers and partners in bringing this investigation to a conclusion. “Moray Council trading standards are committed to protecting the residents and businesses of Moray from unscrupulous rogue traders and the counterfeit goods that they try to sell. Anyone with concerns about counterfeit goods can contact the Citizens’ Advice consumer service on 0845 040506 or anonymously to Crimestoppers on 0800 555111.